Las Vegas offers an experience like no other, and as one of the best gambling destinations in the world you are bound to see, hear, and play some amazing things. While we like adhere to the ‘what happens in Vegas stays in Vegas’ mantra, we’ve let the cat out of the bag and revealed the five best casinos to visit on the strip. First on our list is in the incredible Caesars Palace. There’s a reason they made this the film location for the 2009 movie The Hangover – it offers some of the best gaming and hotel facilities on the strip. 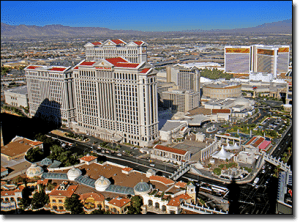 Built in 1966, the iconic Roman-themed venue is located between the Bellagio and the Mirage. It features a 139,200 square feet gaming floor which you can browse with your novelty size frozen slushy purchased from the Numb Bar. You can also play one of 1300 slots (including progressives) or try your luck on one the 240 table games (blackjack, roulette, craps, Sic Bo, and more). If poker is more your style you can check out the 4500 square feet poker room, open 24/7, or if you want a break from gambling you can check out the Forum shops, The Garden of the Gods Pool, or visit Omnia – an incredible 75,000 square feet nightclub. If you are heading here primarily to relive a Hangover night yourself, maybe avoid screaming the Hangover quote ‘this isn’t the real Caesars Palace, is it’ at the reception as they’ve heard it time and time again – and don’t head to the roof as security have surveillance on this. You can however buy some of the merchandise in the resort’s gift shops, including shirts, bobbleheads, coolers and more. 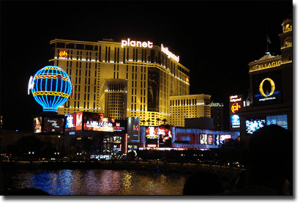 Planet Hollywood is your number one destination if you are more of a partier than a gambler – though you can dabble in both just be careful when at the tables not to bust your budget thanks to one to many drinks. The Heart Bar occasionally offers a bar tab where you pay a set price and you can opt in for all you can drink, all night. The best part is you can go in grab a drink, and walk out to the theatre for a show, or down the escalator to the casino. Speaking of shows, these are the best in Vegas featuring huge names, such as Britney Spears, Jennifer Lopez, Pitbull, and many more. Planet Hollywood is also designed to make you feel like the headliners they offer with movie-themed rooms with memorabilia and, in some, pool tables and hot tubs. The gaming floor is a little small in comparison to the other casinos listed here – set at 64,500 square feet – but there are over 1200 electronic gaming machines and over 100 table titles available. This casino is perfect for the movie buff, the rookie gambler, or the partier however, and you can find it in the centre of the strip. If you’re heading to the Strip you need to visit the Bellagio even if it’s just for the iconic Fountains of Bellagio, featured in many movies including Ocean’s Eleven (the Bellagio is the casino they plan the heist for). The stunning water features are synchronised to music and run either every 15 minutes in the evening or every half hour in the afternoon. Inside the 1998 venue, there’s a stunning botanical garden in a beautiful conservatory, as well as a theatre which regularly hosts shows by Cirque du Soleil. The 100,000 square feet gaming floor offers some of the most premier casino titles along the strip – many of the best poker players in the world visit the Bellagio for high stakes poker, with pots exceeding $1 million available in Bobby’s Room. 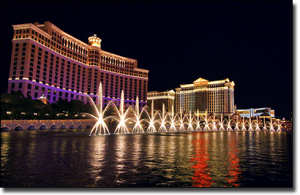 The Bellagio also hosts several Wold Poker Tour tournaments. Additionally, there’s over 1900 gaming machines and nearly 190 table games for players to try their luck when they aren’t marvelling at the beauty of the Bellagio. If you want to be impressed by the outside of a casino as much as you are by the inside, then the Mirage is the destination to visit. 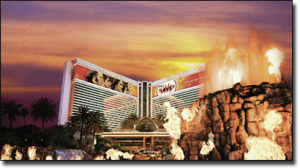 Offering one of the biggest free-standing marquees in the world, The Mirage is actually considered to be the founder of the Las Vegas Strip and the experiences offered here today. When it first opened in 1989, it was considered to be the most expensive casino in Vegas, costing $630 million to be built, and it attracted many tourists and top players from around the world – sparking the Strip to life. There are more expensive complexes now, but you will find incredible features worth checking out including a stunning pool surrounded by luxurious landscaping, a volcano with real fire effects, an aquarium, and more. If gaming is what you are after the Mirage offers a stunning 100,220 square feet gaming floor with more than 1700 gaming machines and over 130 table games. You can even catch a tram here, connected to another casino on the strip known as Treasure Island. This Irish themed casino is our best kept secret, and you will find it located directly diagonal to Caesars. O’Sheas is one of the best venues along the strip if you are after a good time, but maybe avoid it if you are only in Vegas for the gambling. As you first enter the complex you will notice lines and lines of tables featuring beer pong, all set up in a World Series of Beer Pong arena. To play, pay the bar attendant to be given jugs of beer and ping pong balls. In terms of gaming, O’Sheas originally targeted low minimum players but the games do not offer the best house edge anymore – which is why the casino is now known as the ‘party’ casino. 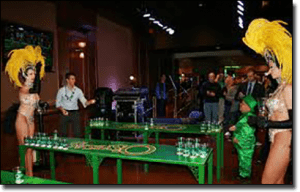 We don’t recommend the gaming here, but we do suggest visiting at least for a few hours for a round of beer pong and the crazy Irish atmosphere. Additionally, O’Sheas made the Guinness Book of World Records in 2001 for the largest crowd to contribute to a nationwide toast – obviously proving the fun never stops here. These are our five favourite casinos in Las Vegas, but we recommend stopping by them all if you get a chance as there are many different, but exciting venues along the famous Strip. For helpful information for beginners, read our guide to what to expect when visiting Vegas for the first time.